8.00 to 18.00 Monday to Friday. During the winter months last departures may take place at 2pm. This popular activity is available most of the year. It is completely undependable on weather conditions, so any time is ideal for a visit. We are comparing Harry Potter Warner Brothers Studio Tour & Transfers Prices from leading ticket suppliers and Try to find you Cheap tickets prices on the market. The Warner Brothers Studio Tour and Transfers combined ticket gives you an opportunity to enjoy the story about the creation of the worldwide popular movie series. For your convenience, this package includes the round-trip from central London to the Warner Bros Studio outside the city. Have a look at many places and find yourself familiar sets from the movie. Among others, you will enjoy being in the Grand Hall, Dumbledore's office and taking a walk down the cobblestone clad Diagon Alley. Furthermore, a ride on the Hogwarts Express and a visit to the Platform 9 will additionally delight you. 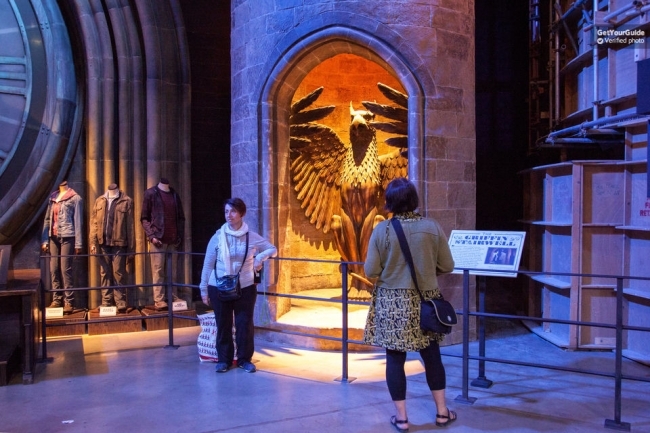 Get yourself acquainted with Harry Potter's magic and see costumes used during the creation of the movie series. This entertaining activity is a must-see for all fans of Harry Potter. Even if you aren't Harry Potter's admirer, you will certainly like the tour of the studios because there is so much to see there. Your Experience With Harry Potter Warner Brothers Studio Tour & Transfers? Get behind the scenes at the Warner Bros Studio and learn the story behind the creation of Harry Potter. Explore the studio's premises and examine a wide variety of props, costumes and sets that were in use as the popular movie series came into existence. Among other places familiar from the movies, you will see the Dumbledore's office, stroll along the Diagon Alley and spend some time in the Great Hall. Explore the fantasy world of Harry Potter and other popular heroes as you discover the Warner Bros Studios on your own itinerary. Gain knowledge about how various special effects that amazed you were done. For an additional convenience, you will have the benefit of return transportation from central London. What Harry Potter Warner Brothers Studio Tour & Transfers Includes? Self-guided tour of the Warner Brothers Studios. Round trip transportation between London City Centre and the Warner Bros Studios. If you’re a big fan of Harry Potter then we recommend conducting a full Harry Potter movie marathon before visiting the Warner Bros Studios. That way, you will make the most of this visit. Also, take a small meal to avoid queuing if you get hungry. Travelers Reviews about Harry Potter Warner Brothers Studio Tour & Transfers? This tour has extraordinary ratings from participants who have visited the studios: 4.7 (out of 5) on Get Your Guide, 5 on Viator and 5 on TripAdvisor. Former participants of the tour via Get Your Guide and Viator agree that the tour is well organized. Comments also agree that the tour is suitable for kids and parents alike. Warner Bros Studio is a disabled-friendly facility. You should be aware that all sales for this activity are final and refunds are not available even if you are unable to take the tour. You can present either smartphone or printed voucher to the authorized person. Note that the Warner Brothers Studio Tour and Transfers is not a guided tour. By booking this interesting activity, you get the entry to the movie-making facilities and the transportation to/from London. The beginning of the tour is at the specified time on the booking website. The journey from London to the Warner Bros Studios takes approximately 2 hours. The end of the tour is at the specified time in central London. Meeting Point: the bus departs fromFountain Square, 121-151 Buckingham Palace Road, London.